The 38mm motors are a standard MonoTube Type Hybrid. Contrail Rockets has more than tripled the available thrust off the pad when compared to other currently certified Hybrid Motors in the 38mm line. 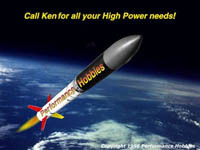 The 54mm Line of motors is an impressive display of the Contrail Rockets Performance Fuels, at a very reasonable price. Motors have a very wide variety of thrust profiles and are available in special effect type fuels as well. Our 75mm line of motors range from K to M Impulse (1280.1-10240 N/s). The Average Impulse of our certified motors exceeds what is currently available from other hybrid motor manufactures through the use of Contrail Rockets High Regression Fuels, that allow sustained thrusts of over 1000 Pounds. The Split Tank Design allows for the use of different combustion chambers and nozzle configurations on all of the varying motor impulses. The 98mm line of motors is a highly versatile, easily adaptable motor system. These motors feature High Regression Fuels, as well as a variety of available Reloads to satisfy anyone looking for some serious power. These motors feature a full 5300cc`s of Nitrous Oxide and Performance to spare! The Ultimate in Performance and Power. No other certified motor even comes close to the total power produced by this line of motors. Peak Thrust of over 2800 Pounds, and total impulses reaching close to 30,000 Ns. The 15000cc Nitrous Tank, coupled with the Industry First Multi Port Fuel Grain put this motor at the top of the pile in terms of performance and power.